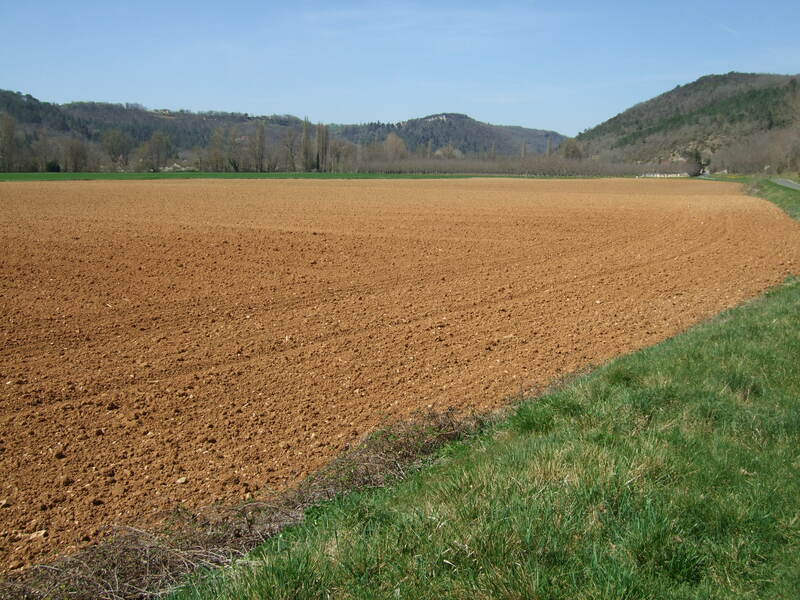 In this posting I’m going to share a lovely, four-hour ride that my wife Jan and I took on this beautiful, sunny day — including a lot of photos of the Greater Daglan Area and the Dordogne Valley as it blossoms. Now let’s be off. It’s 11 a.m., and we hop on our hybrid bikes and go about five metres before Jan realizes that her seat had been set too low for her, when one of our friends borrowed Jan’s bike. She makes the adjustment, and we ride another 50 metres or so, before we stop to chat with neighbours Pierre and Michele, as Michele hangs up her laundry. After several minutes we shove off, leave Daglan proper, and stop to chat with English friends Joan and Peter, who have been staying at their holiday home just outside the village. A tractor has obviously been busy here. 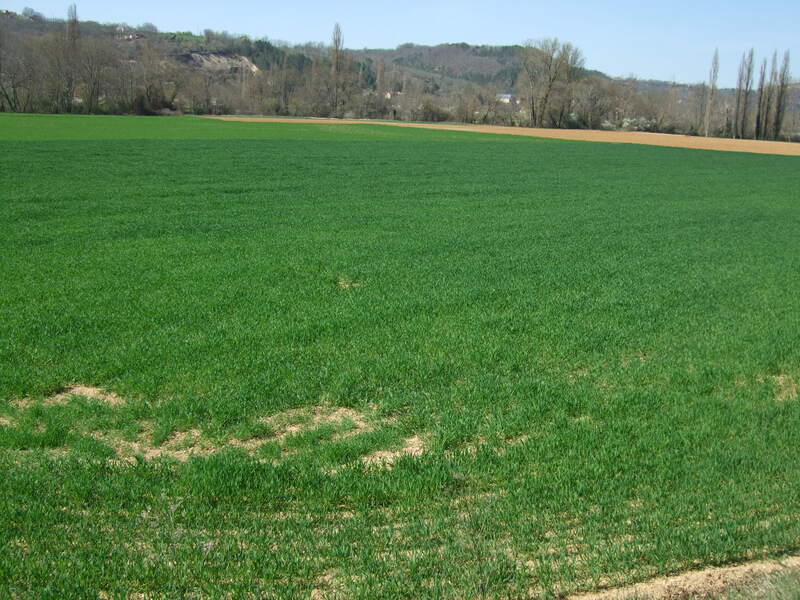 A field of young green plants, just starting out in life. 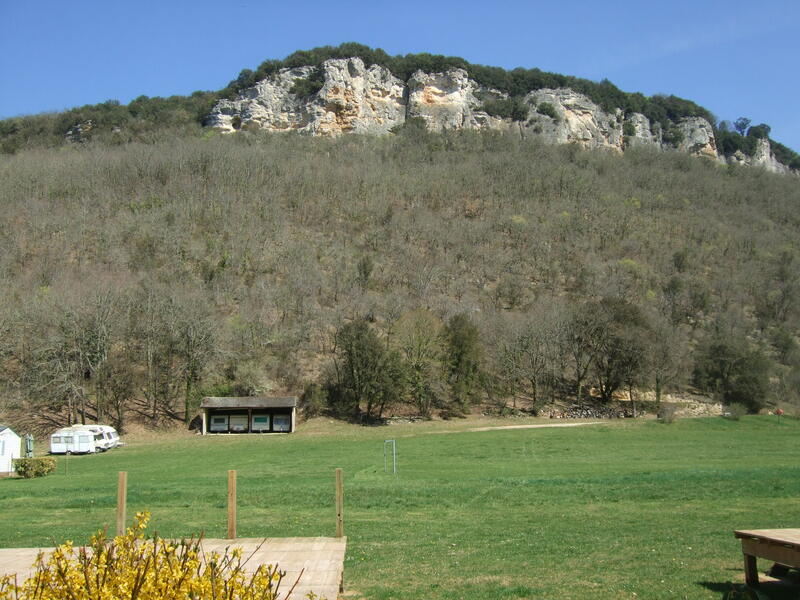 A row of limestone cliffs above the Céou River Valley. We ate our lunch out in the sunshine. 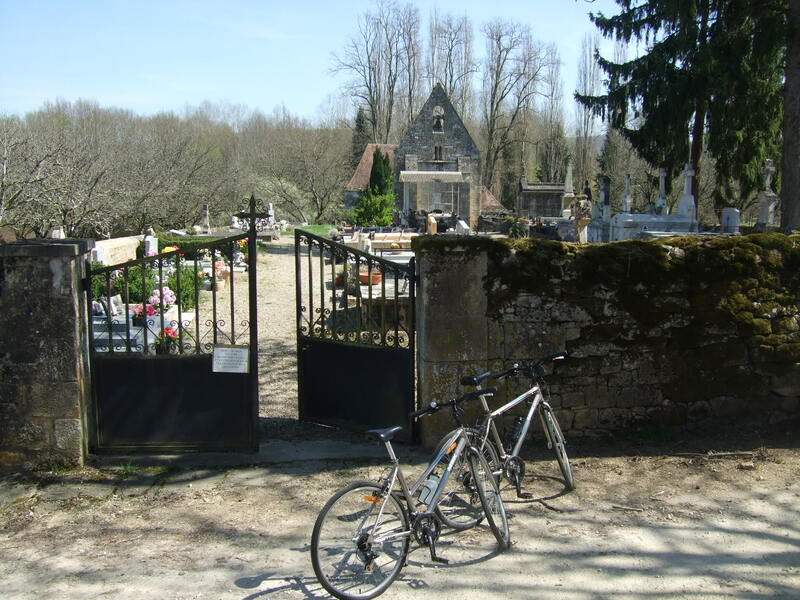 Our bikes are parked just outside the cemetery. 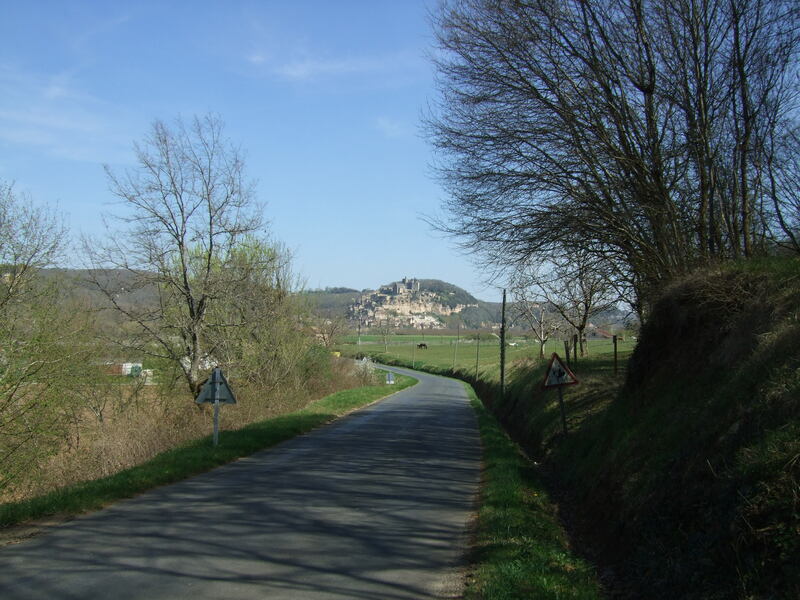 Looking back towards Château de Fayrac. 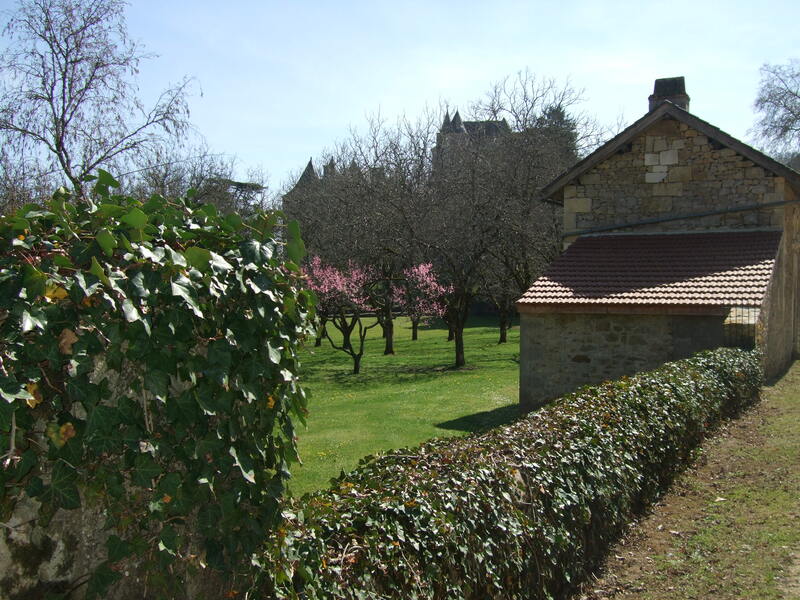 A beautiful château on a sunny day in March. 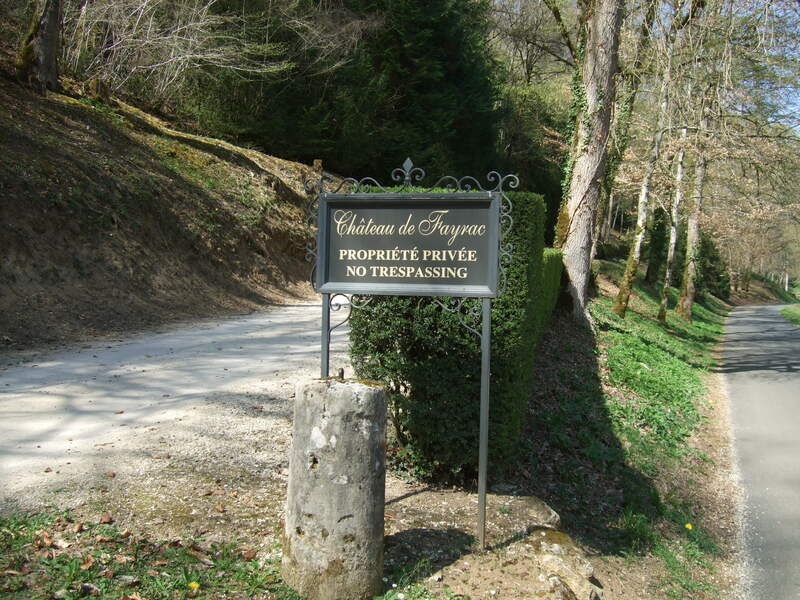 This sign is at the entrance to the château. A château that looks picture postcard perfect. Follow the stone wall to the right and end up in the parking lot. 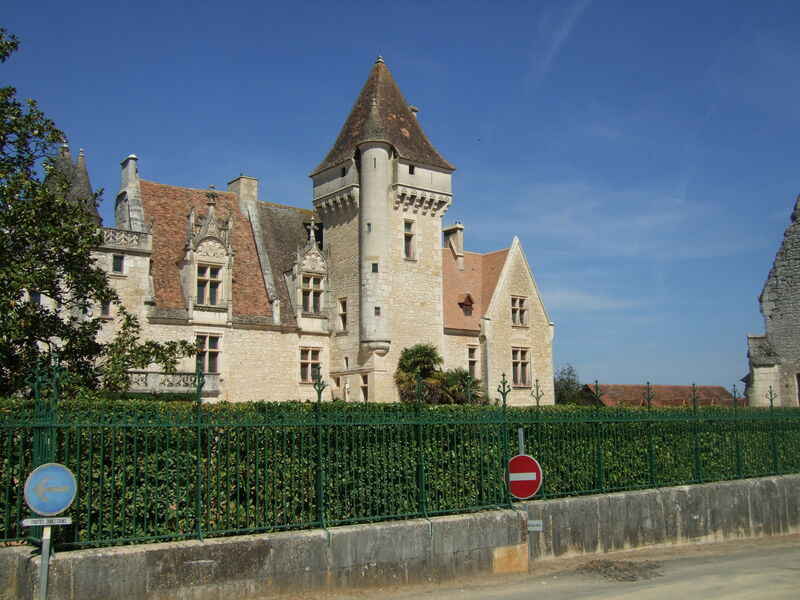 While we took photos, we met a young couple who had hoped to visit the château, and started chatting with them. It turns out they were fellow Canadians, who were touring France before returning to their life in Niagara-on-the-Lake, Ontario, running their own bed and breakfast place. 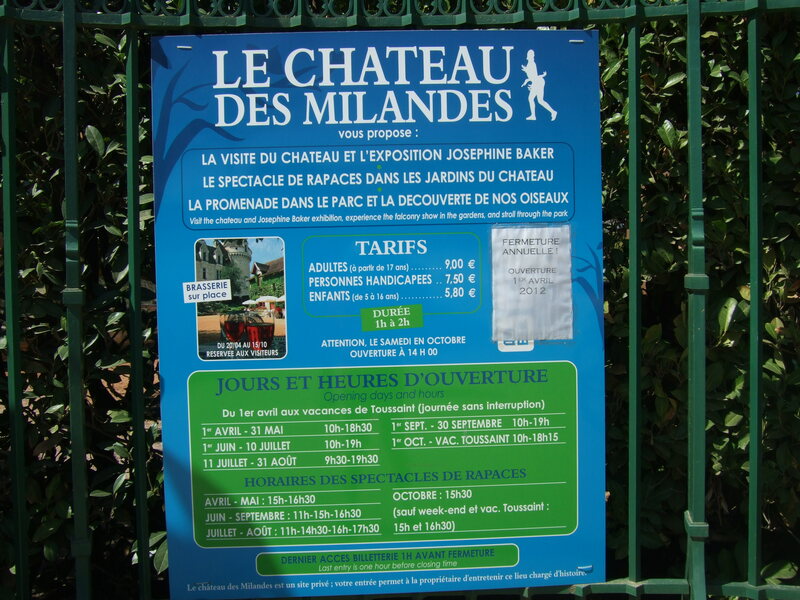 It was a lovely discussion, and gave us a chance to offer them some tips about sightseeing and dining in our area, before they head south for Carcassonne and points beyond. On the road back home. Off in the distance, the stern face of Beynac. 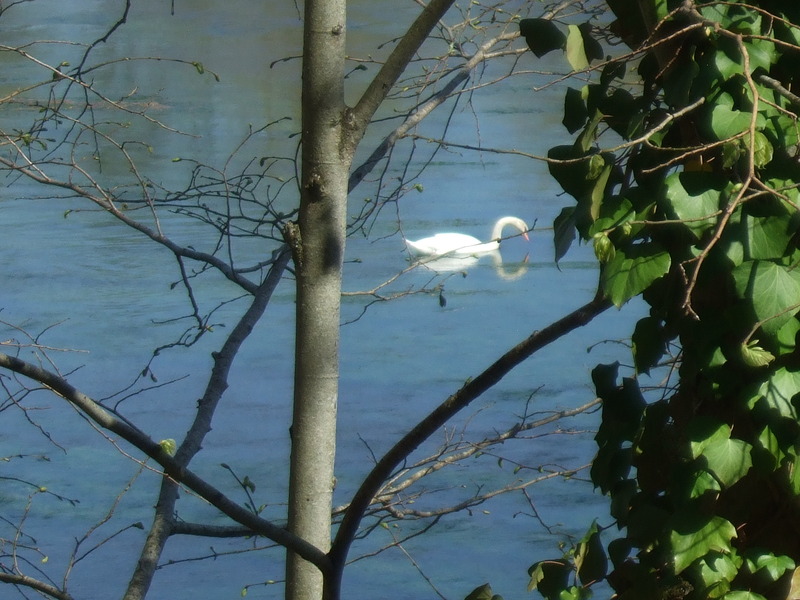 A swan swims on the Dordogne River. 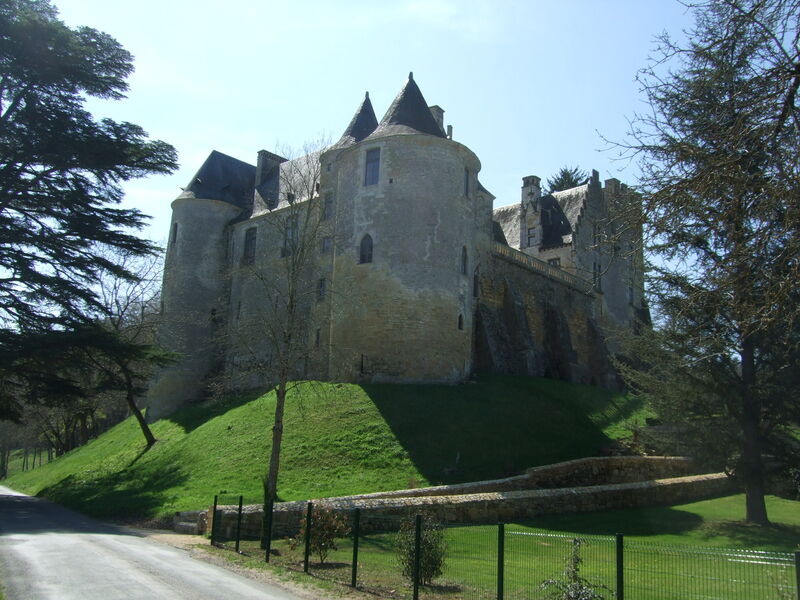 High on a hill across the river: the Château Marqueyssac. 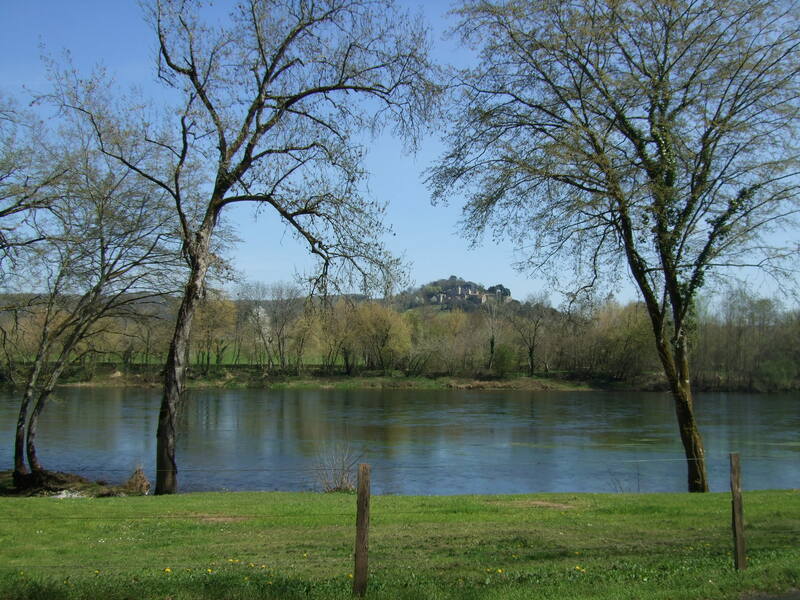 Then we just kept on going, past the café where we’d had lunch, past the cliffs where rock climbers and Peregrines hang out, past the fields and walnut groves and wooded hills of the Céou River Valley. 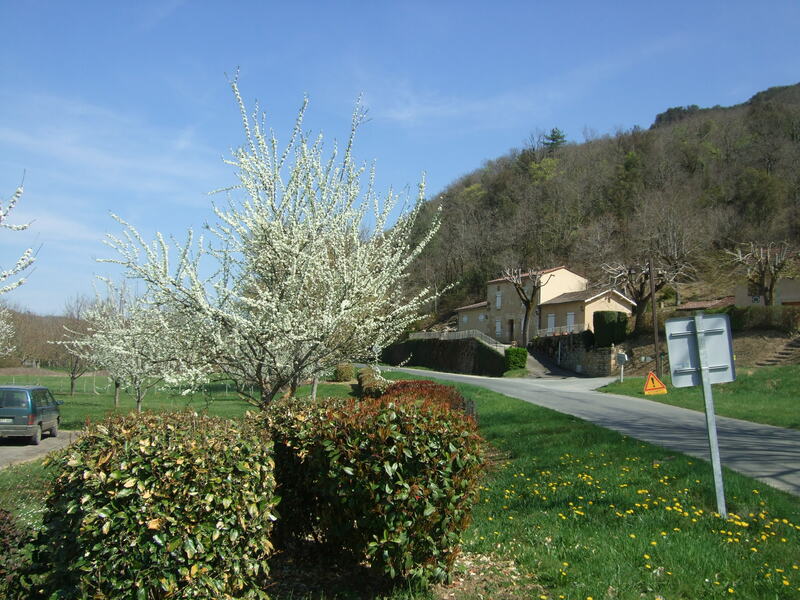 We arrived home almost exactly four hours after we’d left, at 3 p.m., having covered a bit more than 30 kilometres, with very little huffing and puffing (except for the short, sharp climb up the hill on which Château des Milandes sits). 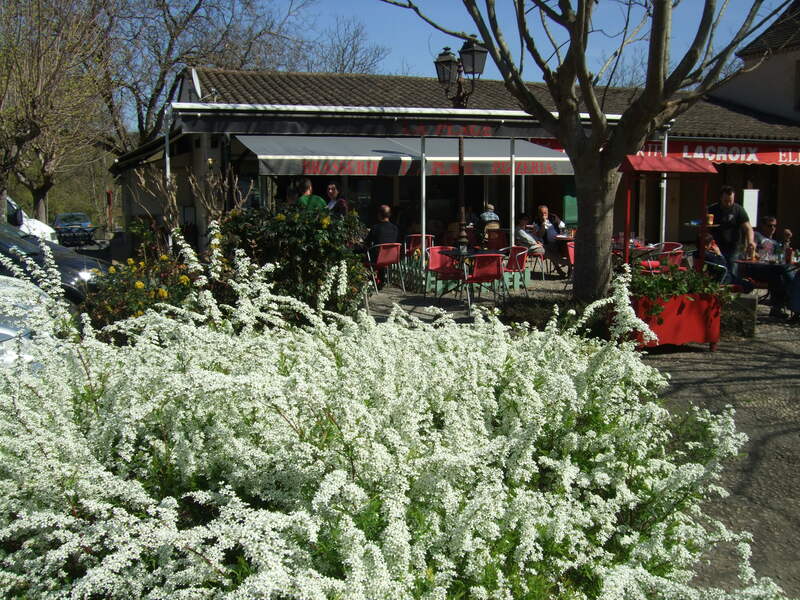 So we had lots of time to freshen up and then drive into Cénac for a bit of shopping. After all, we don’t want to be missing any ingredients tomorrow, when Sunday lunch will be a roast young duckling with a raspberry, walnut and Armagnac sauce. One does have one’s standards. 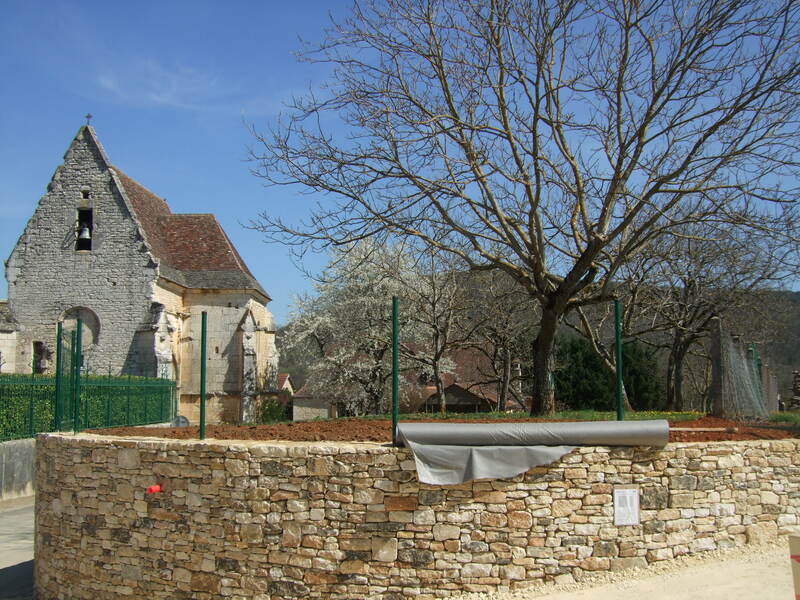 This entry was posted in Bicycling in the Dordogne, Flora and fauna, French food, Life in southwest France, Restaurants in France, Restaurants in the Dordogne, Tourist attractions, Travels in and out of France, Weather in the Dordogne and tagged castelnaud la chapelle, travel. Bookmark the permalink. Thanks for the trip out. Interesting stopping points at the Chateaux and the cafe. BTW for a non biker, what is a hybrid bike? Could it have an engine plus your pedal power, I think the photo only shows a water bottle on the frame? Sorry, Lesley — no motors! A hybrid is an in-between kind of bike. Heavier than the “road bike” or “racing bike” that you would associate with the Tour de France, and lighter than the off-road or “mountain bike” that sometimes has a suspension system. A hybrid is good for city riding, but I also like it out in the country where the roads can be a bit too rough for a road bike, which has very hard (highly inflated) and thin (narrow) tires. Hope that helps! The seat doesn’t look too comfy either! Nice pictures. Can’t wait for spring to arrive in the Toronto area.